Thanks to Anthony Cox for sharing Sofie Hagen's reaction to CancerResearchUK's new awareness campaign. 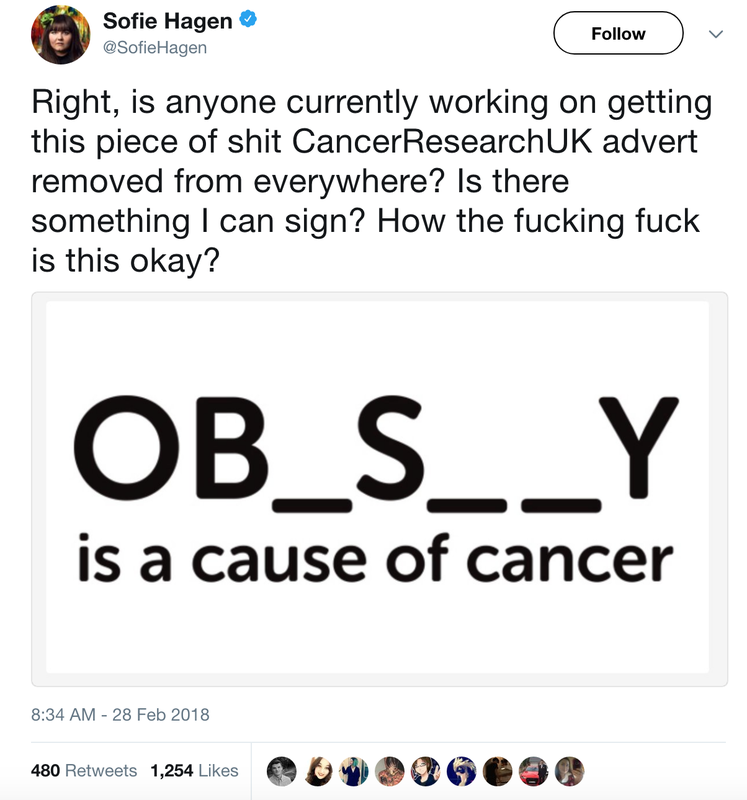 The campaign, which is meant to let people know that there are strong associations between obesity and cancer (and some plausible biological mechanisms that would suggest some causality), though factual, is troubling. By vilifying obesity directly, rather than focusing on the social determinants of health and the built environments that fuel our behaviours and weights, Cancer Research UK's campaign is simply contributing to fear and stigmatization. But if any amount of guilt, shame, blame, or fear were sufficient to treat obesity, obesity wouldn't exist. 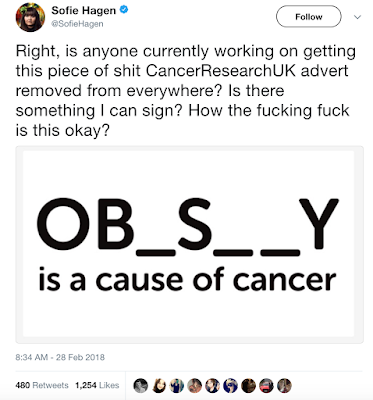 And what's odder still is that Cancer Research UK seems to know that, at least partially, as their pinned video that highlights their campaign showing them telling people that obesity is a risk factor for cancer, they mention that they're asking the government to take action. If Cancer Research UK wants to make a difference, given that there are no gold standard treatment programs (let alone programs covered by the NHS) that will reliably lead to sustained population based behaviour change/weight loss, and that the personal responsibility approach to treating obesity is a luxury that many people's lives preclude, and that the one thing people with obesity don't lack is constant messaging that tells them that there are risks to obesity, instead they could mount a campaign to educate doctors about how weight bias has been shown to lead physicians to screen their patients with obesity less frequently for various cancers (including colorectal, cervical, and breast), and to encourage those physicians to treat their patients with obesity the same as they treat all of their other patients.